Two-piece toilets tend to be substantially cheaper than one-piece equivalents, so they will appeal to buyers with a tight budget or those who would rather spend extra on design or features to enhance the bathroom experience. Although cheaper, two-piece toilets still offer many of the features and designs available in the more expensive one-piece equivalents. There is a wide range available from every manufacturer in elegant designs and colors, which should enhance the style of any bathroom. This ionized barrier repels particles, bacteria and mold. The result is less cleaning and chemical products. The tank and the bowl are protected by the patented SanaGloss glaze that repels particles, mold and bacteria. The unit is ADA compliant. This product has a pressure assisted flush, which is very water efficient, using just 0.8 GPF. The pressure then forces the water powerfully into the bowl, and then the siphon jet bowl pulls the waste out of the bowl, leaving it sparkling clean. The bowl and tank have smooth lines, and the bowl is skirted making the unit easy to clean and sanitize. The AquaPiston canister dispenses water over all 360 degrees of the bowl, ensuring an effective and more powerful flush. This toilet has a modern high-profile design with an elongated bowl. In the middle of the price range, it is available in glazed cotton white. A chrome-plated trip lever is mounted on the side of the tank. Both tank and bowl are protected by TOTO’s patented SanaGloss glaze. This ionized barrier repels particles, bacteria and mold. The result is less cleaning and chemical products. SanaGloss also ensures that the toilet retains its glossy good looks for years. The unit boasts the commercial grade G-Max flush system, which is both quiet and powerful. It has a three-inch flush valve and a computer-designed, fully glazed trap, which along with the siphon jet flushing action, forces water into the bowl and then quickly removes all waste, ensuring that the bowl is sparkling clean after every flush. It uses 1.6 gallons of water per flush (GPF). The seat is not included in the pack. Read the full Toto CST7 Review here. 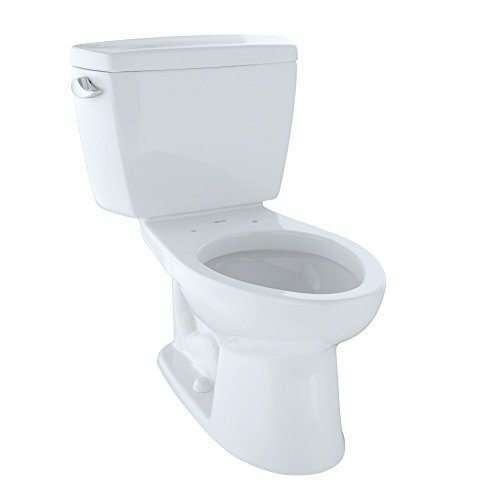 The Toto CST744SL is a reasonably priced toilet with a high-profile tank and an elongated bowl. It has a chrome trip lever and is available in cotton white. The tank and the bowl are protected by the patented SanaGloss glaze that repels particles, mold and bacteria. The high-gloss finish requires less washing, reducing the need for chemical cleaners and saving water. The glaze ensures that the toilet retains its gloss and color for years. The toilet is ADA compliant. This toilet has the commercial grade G-Max flushing system, which is both powerful and quiet. This system sports a three-inch flush valve and a computer-designed fully glazed trap. Together with the siphon jet action, water is forced into the bowl and the waste is rapidly removed, ensuring that the bowl is left spotlessly clean after every flush. It uses 1.6 GPF. This toilet can be upgraded by adding a SoftClose seat or washlet. It has a one-year limited warranty. This toilet is at the bottom of the price range. It has a high-profile tank and an elongated bowl. It is available in white. The flush button is located on the top of the tank and the tank and bowl are constructed of vitreous china. The unit is ADA compliant. This product has a pressure assisted flush, which is very water efficient, using just 0.8 GPF. It is also very quiet. A seat not included. This reasonably priced toilet has a round bowl and a high-profile decorative tank. It is available in white. The activator is mounted on the top of the tank. The tank and bowl are finished with American Standard’s EverClean surface, which resists the build-up of bacteria, mold and mildew. Bacteria are known to cause odors and discoloration, so the EverClean finish also helps to preserve the high gloss and color of the toilet for years. This unit sports a dual flush of 1.28 and 0.92 GPF for water efficiency. With its siphon jet bowl and PowerWash rim, this is one of the most water efficient toilets on the market. The water is pressurized in the rim chamber. The pressure then forces the water powerfully into the bowl, and then the siphon jet bowl pulls the waste out of the bowl, leaving it sparkling clean. A seat is not included, but two color-matched bolt caps are included in the pack. The manufacturer offers a limited lifetime warranty on porcelain parts and a limited five-year warranty on mechanical parts. In the mid price range, this toilet is a decorative high-profile unit with an elongated bowl. This standard-height product is available in cotton white. It has a chrome-plated, top-mounted dual flush button. The bowl and tank have smooth lines, and the bowl is skirted making the unit easy to clean and sanitize. The SanaGloss finish repels debris, bacteria and mold. This product, therefore, requires less cleaning, reducing the need for water and chemical cleaners. The finish will also ensure that the product retains its color and shine for years. The Dual-Max flushing system allows the user to conserve water by selecting the full or half flush, which use 1.6 and 0.9 GPF, respectively. The toilet is WaterSense certified. A seat not included. The toilet has a one-year limited warranty. This mid-priced unit has a high-profile decorative tank with a polished chrome lever. The round bowl makes this toilet ideal for small spaces. This is one of Kohler’s Comfort Height toilets, meaning that it is the height of a standard chair, making it easier for adult users to sit down and stand up from the sitting position. The AquaPiston canister dispenses water over all 360 degrees of the bowl, ensuring an effective and more powerful flush. This canister covers most of the seal making this toilet leak free. The toilet is WaterSense certified, using just 1.28 GPF. The seat and the supply line are not included. The product carries a one-year limited warranty. At the top end of the mid-price range, this unit has a decorative high-profile tank with an elongated bowl. The tank is fitted with a chrome trip lever. It has a skirted design, making it easier to clean. The bowl and tank are finished with the patented SanaGloss ceramic glaze; the ionized surface forms a barrier that repels particles, bacteria and mold. This reduces the need to frequently clean the surface meaning less water usage and less harmful chemicals. It also ensures that the gloss and color of the toilet are retained over time. The double cyclone flushing system uses water jets to propel water into the bowl. The system cleans the bowl perfectly every time using just 1.28 GPF. The unit is WaterSense certified. A seat is not included. This toilet is priced as a specialist unit, so it is at the top of the price range. This product has been designed to allow for installation in a bathroom where it normally wouldn’t be possible. The toilet can be installed up to 15 feet below the sewer line, and 150 feet from the soil stack. It can also handle the effluent from a basin, bath or shower. The macerator unit has a pump that is capable of pumping waste vertically for 15 feet or horizontally for 150 feet. The toilet is constructed from vitreous china. It has an elongated bowl and insulated tank with a plastic trip lever. It uses just 1.28 GPF. It carries a one-year warranty on the china components. Whatever the requirement of your household, you’re bound to find a two-piece toilet that will meet your needs, regardless of color, design, space or features.